Finding the revenue to meet the critical needs of street maintenance, affordable housing, transit and public safety is the most urgent issue for City leaders as the annual budget-setting process begins. City government is funded by a variety of revenue sources, some of which can only be spent on services and others that can only be spent on specific infrastructure projects. 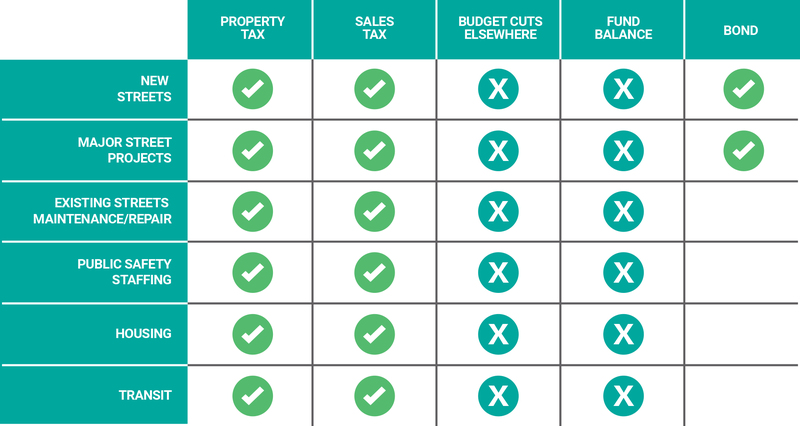 The challenge is to find a balanced mix of taxes and fees that can adequately fund services for a growing City, while not overburdening residents and taxpayers. ✔ = indicates that the revenue source can be used for the specific need. X = indicates that the funding either can’t be used or is limited in that it can only fund specific components of a need. While Salt Lake City is considering all available financing options, City officials see two that stand out as viable and reasonable – increasing the City’s portion of sales tax and asking voters to consider approving a General Obligation (GO) bond. When legislators decided to build the new state prison in northwest Salt Lake City, they provided the City with the ability to raise its portion of sales tax by 0.5 percent (or 5 cents on a $10 purchase). This would generate about $33 million a year in additional revenue. Sales tax is paid on most purchases made in the City (with the exception of groceries). Approximately 60 percent of the sales tax revenue would be paid by nonresidents – office workers, visitors and tourists. Two General Obligation bonds that were approved by voters more than a decade ago to finance the Main Library and The Leonardo will be paid off in mid-2019, providing the opportunity to finance other projects without a large increase in property taxes. City voters approved a new $87 General Obligation bond to streets reconstruction on November 6, 2018. Bond revenue needs to be used for specific one-time projects; in this case, major road and infrastructure projects.